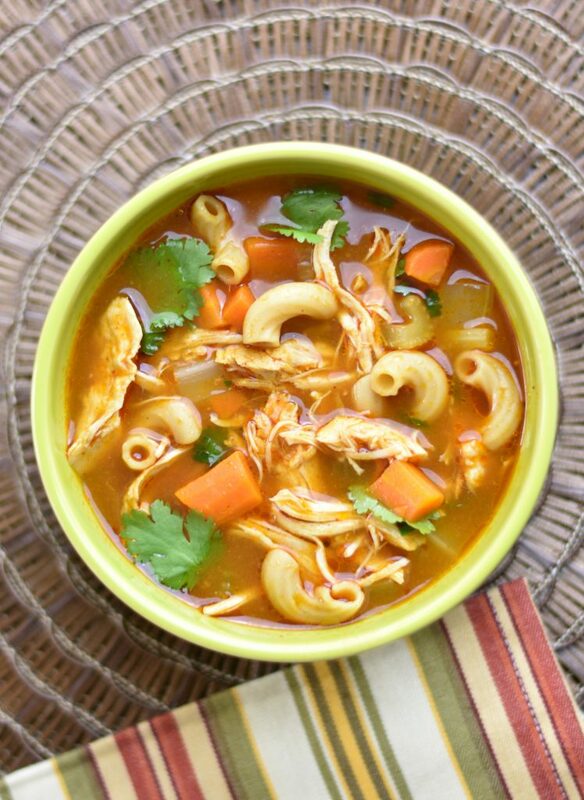 Earthy and cozy is how I would describe this Chicken Noodle Soup with Ethiopian Spices! It’s the same old fall-winter classic, with Ethiopian food flavor. I season this soup with an Ethiopian spice blend called Berbere, and the result is one satisfying bowl of chicken soup. In my original recipe for a classic Homemade Chicken Noodle soup, I pressure cook bone-in skinless chicken with root vegetables like carrots and celery, and season it with spices and herbs. I cook the noodles in the simmering broth and the result is a simple meal that warms up your soul! During fall and winter, I make this chicken soup a lot, almost twice a month. It’s a very convenient and quick one-pot meal that comes together in under 30 minutes. Recently, I have been making many variations of it. I keep changing the seasoning and spice blends in this soup recipe. This combination is a definitely a home run! , which is a combination of warm whole spices that are toasted and ground together. 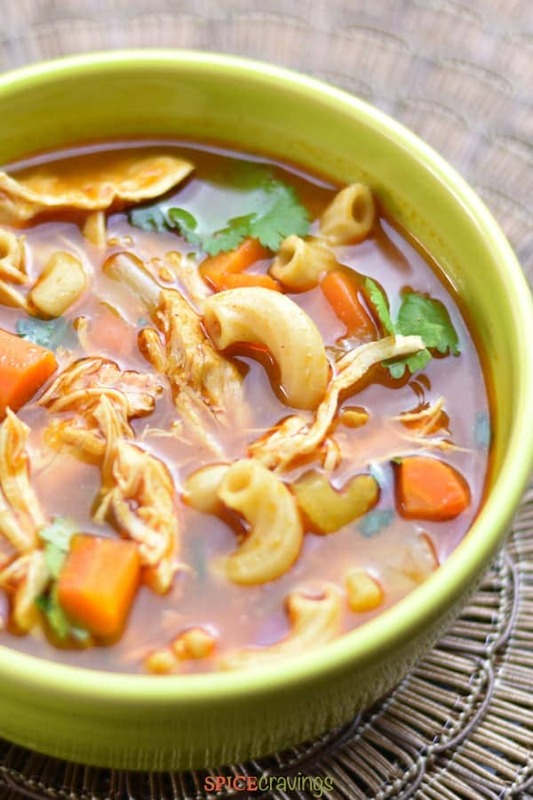 This spice blend adds a distinctive tangy and mild spicy and smoky flavor to the soup. I make this soup in my programmable pressure cooker, Instant Pot, but you can make it in any pressure cooker. Simply follow the suggested timing for cooking chicken breast or soup, and this recipe will work just fine. 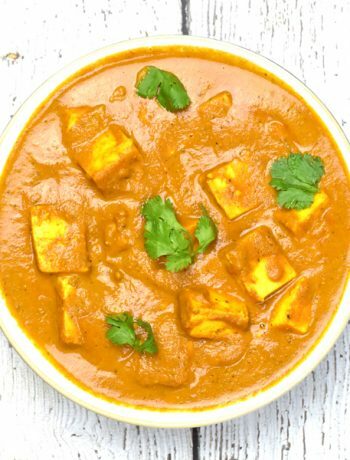 • Turn the instant pot on SAUTE mode. Wait 30 seconds and add olive oil and crushed garlic cloves. Let the garlic sizzle for 30 seconds, then add chopped celery and carrots. Add all the ingredients in the pot and stir everything. • Cancel Saute. Close lid. Set valve to Sealing position. Cook on Manual or Pressure Cook for 6-8 minutes, depending on how thick the chicken breast it. When I use breast halves, like in the video, I set the time to 6 minutes. • Open after 10 minutes of natural pressure release (NPR 10). Remove chicken for shredding. Use two forks and pull apart the chicken. Put the shredded chicken back in the pot. Garnish with cilantro and lime! • Making this soup on the stove-top is a breeze. Take a heavy bottom sauce pan. Heat olive oil in the pan and add crushed garlic to it. As soon as it starts sizzling, add everything else and let it come to a boil. • After that, reduce the heat to medium, cover the pot and let it simmer for 15-18 minutes, or till chicken is tender enough to shred. Remove the chicken, shred it and add it back to the soup. Garnish with cilantro and you’re all done! 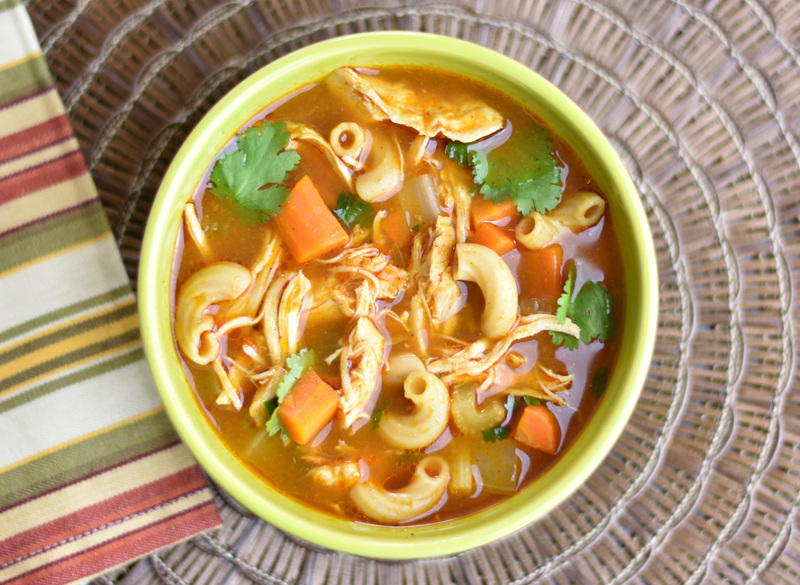 This chicken soup recipe is very easy to customize to your taste. If you don’t like spice, reduce the quantity of the Berbere seasoning and increase the ground coriander. If you’re like my husband, and like an extra kick, add a couple of tablespoons of Sriracha to it instead of the tomato paste. To make this soup vegetarian, you can skip the chicken and add some canned chickpeas instead, they taste awesome in this soup ! 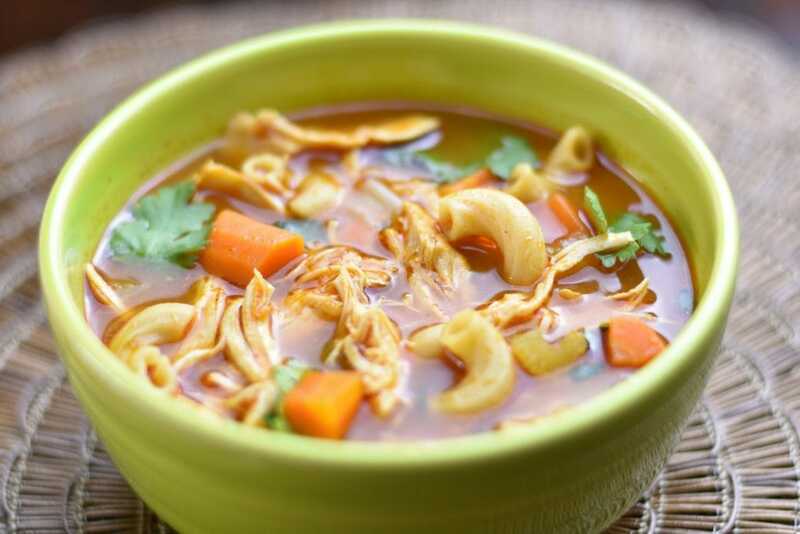 To make this Chicken Noodle Soup healthier, I added whole-grain elbow macaroni to the soup. 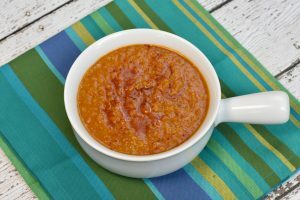 It not only increases the fiber and reduces the net carbs per serving, it also increases the protein content of the soup. Here are several more Chili and Soup Recipes from my kitchen. 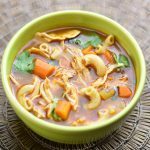 This classic Chicken Noodle soup is made by simmering chicken and vegetables, such as carrots and celery, spices, herbs and small noodles in chicken broth. This recipe uses the Ethiopian Spice blend called Berbere Seasoning to enhance the flavor and made in an instant pot. Chop celery and carrots and keep aside. Turn the instant pot on SAUTE mode. Wait 30 seconds and add olive oil and crushed garlic cloves. Let the garlic sizzle for 30 seconds, then add chopped celery and carrots. Add all the ingredients in the pot and stir everything. You can skip the saute step and make easily this a dump & start recipe. Cancel Saute. Close lid. Set valve to Sealing position. Cook on Manual or Pressure Cook for 6-8 minutes, depending on how thick the chicken breast it. When I use breast halves, like in the video, I set the time to 6 minutes. Open after 10 minutes of natural pressure release (NPR 10). Remove chicken for shredding. Use two forks and pull apart the chicken. Put the shredded chicken back in the pot. Garnish with cilantro! Take a heavy bottom sauce pan. Heat olive oil in the pan and add crushed garlic to it. As soon as it starts sizzling, add everything else and let it come to a boil. After that, reduce the heat to medium, cover the pot and let it simmer for 15-18 minutes, or till chicken is tender enough to shred. Remove the chicken, shred it and add it back to the soup. Garnish with cilantro and you're all done!